Thank G*d for small blessings. We have been cranky, overworked, put upon and somewhat under the weather as far as inspiration goes this last week but luckily, this week’s Photo Challenge: Happy arrives just in time for our Canadian Thanksgiving weekend celebration. It is, like most things and ultimately, all about a state of mind – be it brief or prolonged, which we can measure against our own often high standards or those of the people that surround us. This Sunday, everyone is very happy with a groaning board of tasty treats and a plump, organic bird prepared with a few additions according to Gordon Ramsay’s Christmas Turkey recipe (which, by the way, is never fail mouth-wateringly moist and even better in a convection oven). So family sated, desserted and all gone home by a decent hour, I am happy it is over. A VPR radio broadcast last year offered solutions for dealing with holiday stress, especially for those who suffer from self-inflicted performance anxiety and are their own worst critics: Relax, for in the end, our best efforts are often better than that and only we really know the difference….. Happy Thanksgiving! Thank you for visiting my blog. Looks good! 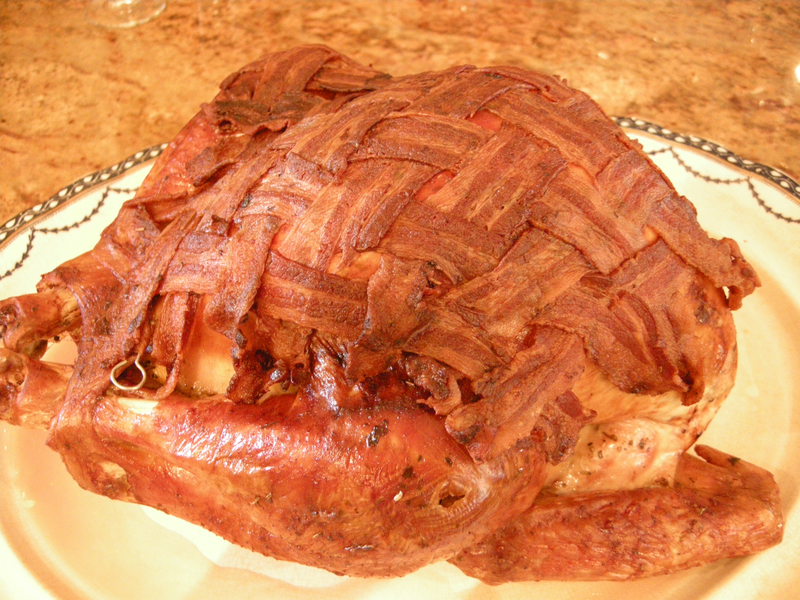 Wrapped on bacon? It must be a winner! Yes, and stuffed with an onion, orange, lemon and bay leaves! Thanks so much – I realized only later that evening that I could have joined yours as well for that turkey really was delicious!